See another part of Hawaii with this day trip from the Big Island to Pearl Harbor. Sit back and relax as everything is taken care of -- from flights to car transfers to admission tickets. Get picked up at the airport in Honolulu and whisked off to Pearl Harbor. 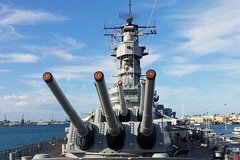 After meeting the tour coordinator and picking up tickets and vouchers, head off to the USS Arizona Memorial, USS Bowfin, USS Missouri and Pacific Aviation Museum, complete with some of the audio guides and watching video of the December 1941 attack. Before being dropped off at the airport, get chauffeured around town, taking in the sites and seeing landmarks such as the Iolani Palace, King Kamehameha statue, Washington place, First church and Punch bowl national cemetery. Explore Pearl Harbor and Honolulu on this day trip from the Big Island. The only obligation is to have fun, as all the details of the tour -- from flights to car transfers to tickets -- are all taken care of. Get picked up from the airport in Honolulu and enjoy a refreshing welcome beverage. Once at Pearl Harbor, begin exploring with your audio guide, taking in the historic ambience of the place. Visit the USS Arizona Memorial, USS Bowfin, USS Missouri and Pacific Aviation Museum, learning about each ship and place and about the Japanese attack on December 7, 1941. The tour is fully narrated by professional trained tour guide, audio set and film footage. After the tour, hop back in the car for a complimentary short Honolulu city tour. Visit sites such as Iolani Palace, Washington Place, the statue of King Kamehameha, the Hawaii State Capitol building and Punch bowl National Cemetery. A light breakfast and Pearl Harbor lunch is included in this package + One complimentary gift of Pearl Harbor 75th anniversary of the attack "mug" per reservation. This is an A to Z package for you to visit Hawaii's # 1 attraction means everything you need from A to Z is included in this package.